Join our Swedish summer courses and get up to speed with your Swedish! Take the chance to improve your Swedish this summer! Did you know that multilingual professionals are among the most wanted employees in the job market? 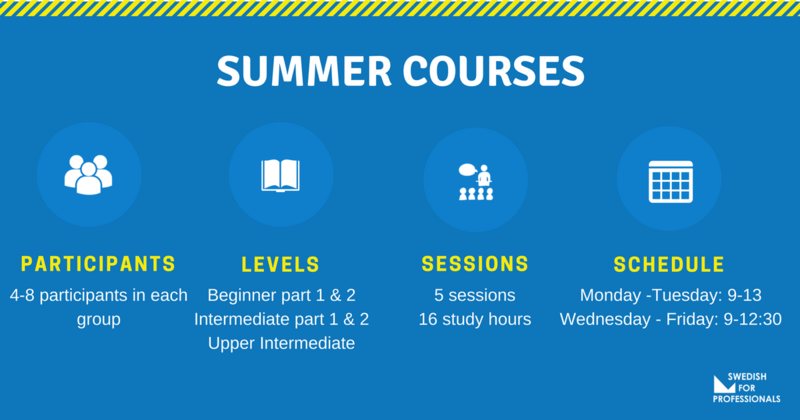 Boost your career and study Swedish with Swedish for Professionals during the summer! Our courses are designed to accelerate learning and build the confidence needed to speak Swedish in your everyday life. Each course will be customized to the group's needs and the participants will get access to all of our digital tools. Our language coaches are characterized by high energy and drive that motivate the adult learner. During the course, you will get access to our own digital learning material. Our digital tools are making it possible for you to learn Swedish in your own time, thereby extending the learning experience outside the walls of the classroom. The learning process is tailored to be both challenging, engaging, rewarding and fun! We truly believe that fika is a key to learning Swedish! That’s why fika will be provided every day in order to help you boost your learning experience! All the course material is included in the price, as well as our online assessment test and full access to our digital tools during the course! Take the chance to accelerate your Swedish language skills by signing up here and contact us at hello@swedishforprofessionals.com if you have any questions! Now, you can also find our Swedish language courses at kurser.se!